「Featured Post」~AKB48’s 「Beginner」、record breaking, innovative…thought provoking and there’s even a bit of chicken♥ from Heaven~*. | モーニングBerryz48…the morning after….. "Always wear protection before reading…(^q^)." ← ~Joining the rest of the human race, it’s a new addition to the family~♥…. AKB48’s “Beginner” can be ordered here @ Cdjapan. 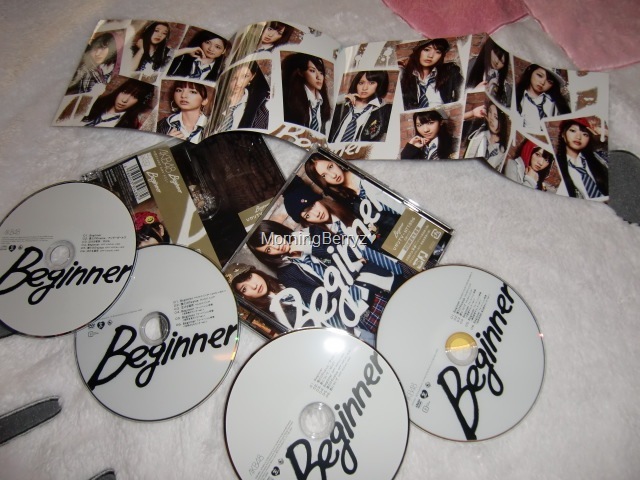 AKB48’s “Beginner” can be ordered here @ HMV Japan. AKB48’s “Beginner” can be ordered here @ YesAsia. Hmm….but before anything I must gush~* about the “center” versions which are on both LE’s and if you purchase both you’ll receive “center” pv versions for Yukorin, Mariko, Jurina, Acchan, Tomochin & Takamina~♥. When my singles first arrived I was puzzled to the wording of “DVD ver.” next to the “Beginner” pv track and it took the clueless me a bit of searching to figure out that there was a digital download for the “original version” and add to that the reason behind this is that this pv was deemed too violent to be included with the single releases :O. Being banned in music land isn’t really a common thing these days it seems as society as it is may have been much too numbed by now by the level of violence in lyrics and on t.v. and yes! especially in video games (sorry gamers but there’s some really questionable stuff out there :O!). But how desensitized are we really? Searching and looking back it seems that album covers are as much of a nuisance to what is deemed appropriate for viewing…..like with Bon Jovi’s “Slipper When Wet”‘s original cover which was well….sexual* to say the least and suggestive and instead we ended up with…….a dark trash bag sprayed with water for this multi~million album seller’s cover? xD and most likely the most famous banned pop~culture music image must be The Beatles “butcher cover”…and going way back then the solution as the singles had already been pressed and published with jackets was to simply paste the new safer cover over the older banned one :O. 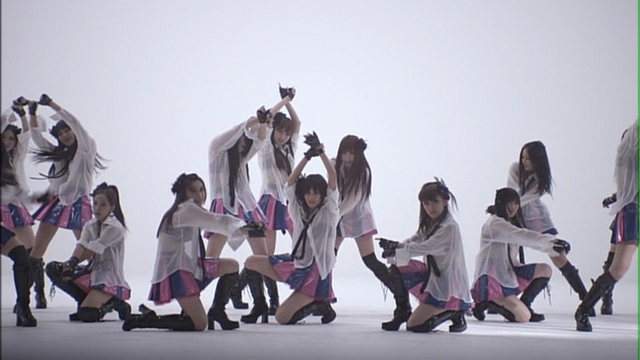 However, surely with an idol group there’s a much younger audience as well so I’m thinking this was perhaps the main reason for banning the original version but as you watch it AKB’s (original) “Beginner” music video isn’t there merrily for shock value or just to stir a buzz (albeit having a banned pv will do this to a “T”) as you can draw parallels just by hearing the song’s lyrics and how “beginning” anew and breaking the same old chains of life or really any aspect of your life can mean so much in moving forward and not becoming a part of a system (game system)…or what is maybe just “expected” of one? The message of “Beginner” is both positive and powerful x’s a lot while the video game violence appears to be for yes~! initial shock value but more so for drawing this analogy as you see the girls break away from the “system” freeing themselves from unconscious minds~. The middle with Acchan taking her own arm is perhaps the most disturbing and especially when coupled with her screams which resonate away from the music and yet in that single instance the message is profound. 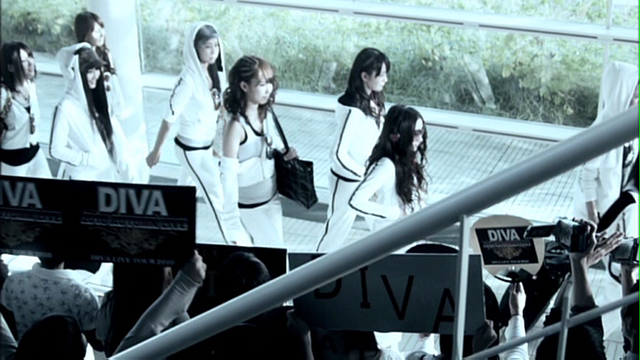 For me this also sparked~* a memorable moment as I was taking my very first baby steps towards loving everything AKB when introduced to the early sub~group “Chocolove” with the recommendation from denadel, and right when everything started as you see my very very first visual of anything AKB was with their pv for “Ashita wa ashita no kimi ga umareru” and this pv in itself holds some very shocking visuals of its own….girls being shot by a gunman and spewing from them it’s ….well you guessed it chocolate :O. In dark contrast the song is as sweet~♥ and catchy as they come in J~Pop so coupled here with those visuals it’s quite a pv!…..well let’s just say that in the end it was all just a bad chocolate~y dream =). Now for the worthy part and terms of sales like we haven’t seen in years, you see we haven’t even reached that just yet. And with talk of sales numbers being perhaps “misleading” in some ways perhaps due to the inclusion of handshake event tickets/voting tickets for AKB’s next year fan request top 100 concerts and the such being included with the LE releases (note: other idol groups including H!P have been including event tickets in their singles for years so it’s not like a new ploy to push sales but you have to take your hats off to the ingenuity in which AKB does this versus other idol groups….accessibility and empowering fans with a vote which will see direct results in an upcoming concert……wouldn’t it be awesome to be able to vote in Momusu’s next concert song~list?…and then see it then unfold live in a multiple day concert event =D. How can anyone fault that? really =) ) also what cannot be overlooked is that AKB produces and presents to fans single releases which go way beyond the standard product. With just two single versions (and no pv DVD single) AKB features separate pvs for each song including now both coupling with track extras (for a total of 4 pvs) and I must emphasize that they’re full~blown productions of their A~sides, b~sides and extra coupling with~s. Storyboards brought to life with no chains on time as for example with this single the “extra” pvs for “Boku dake no value” and “Kimi ni tsuite” have running times of 8:37 and 7:02 respectfully as they’re not just music videos and in some cases much more like mini~movies or features~. So with the sales numbers here you can attribute it to not only the excitement and draw of those event/song voting tickets but also I think very much to the quality of just how AKB is being lead and produced and it’s no doubt in a progressive state if you view their sales from single to single leading to now their record breaking numbers. Yay~! for the Undergirls~♥!! And don’t let the sweet melody fool you as this song is tied into something most ugly……the bullying that has plagued Japan (and other schools everywhere =( ) for so long. I’ll admit after watching this that girls I think can be much more mean~hearted towards one another and it can come along for many different reasons. Sometimes it’s just a product of the many cliques that form inevitably when so many are brought together, other times it’s from jealousy or from relationships, race and gender or sexual preferences….sadly bullying is often kept to oneself =(. It’s really one of the worst things that you can subject anyone to. Wear the “shoes”….reflect first. Bullying should never occur anywhere or to anyone. 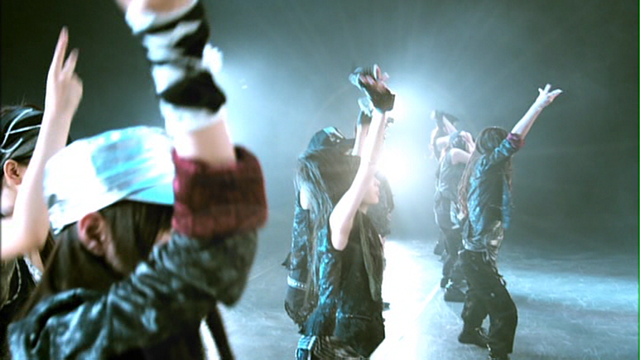 Yep~* you probably knew I couldn’t resist at least one shot of A~min~♥ in there っo(*´∀｀)o！、。。and then there’s this…. …Myao~* says that all of those mysterious falling colored spheres/bubblegum drops/painted alien~grapes/miniature balloons….taste just fine! Nice! Continuing with the single sales~worthy thingy, Mint is the ingenious creation of asking AKB fans to vote for their favorite members to be included in this fantasy~group online while immersed in the interactive fantasy world of Ameba Pigg where the actual members and fans alike can mingle in real time online with one another while embodying the cutest of cutest caricatures =)! 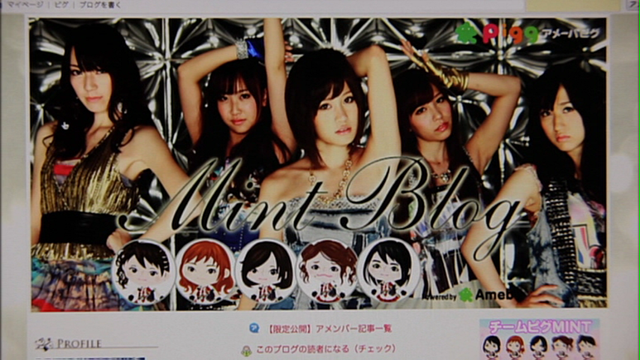 Here Acchan takes the center as Mint is set to release their final single but there’s a lot of hidden emotions unknown to Acchan until she peruses the archives of Mint’s blog heading back through time as her fellow members share~* and reminisce the groups’ time together~♥…. ..and Kasai~♥ soooooo so cute!!!! Her voice so much like that of a professional seiyuu, here she shines~* =)! This entry was posted in AKB48, Featured and tagged akb48, beginner, boku dake no value, kimi ni tsuite, nakeru basho. Bookmark the permalink. 16 Responses to 「Featured Post」~AKB48’s 「Beginner」、record breaking, innovative…thought provoking and there’s even a bit of chicken♥ from Heaven~*. now u think DIVA and MINT go be active sub-units ? I’m thinking that there would be lots of options though with AKB? And while I don’t support downloading instead of purchasing music I’m understanding your situation as Brazil’s 60% tax is unimaginable and much too high =(. 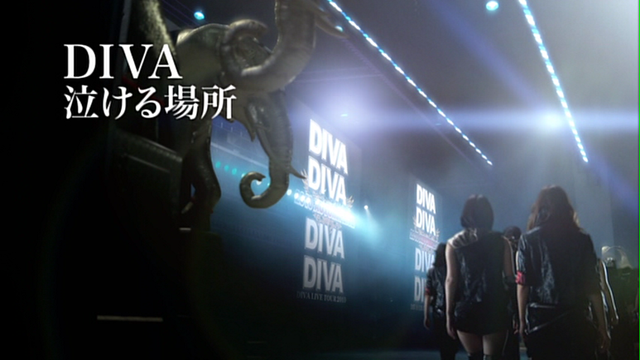 DIVA’s song is awesome!..and isn’t it amazing~* how much production and writing the producers always put into AKB music videos?..I mean they’re almost like separate mini~movies in a way. I’m not thinking that DIVA and MINT will become featured regulars but you just never know and if the fan response is good enough perhaps they’ll push for more songs and releases. Still though I’m doubtful as these groups are more like fictional creations so maybe their one~shots? Ehhh? really?…loving “Beginner” (*´∀｀*) ♪♪！！！！！It’s so aggressive and visually coupled with the pv versions (the dance ones though!, not the original) like with the “center” member featured versions they’re so dynamic and in many ways alluring too and I’m just like wow~! I got mine in itunes Japan but I’m running out of yen. I wish US iTunes would update their jpop artists. I don’t want to use all the money in my account. Maybe I will have to go through Ohta 😦 I wanted to avoid using a 3rd party source since I don’t want to pay so much just for service. @ Hydeo, I do understand much better why it’s so difficult with the taxes being so high in Brazil for imported items, however with that being said I still see downloading (without purchase) as stealing from artists/idols. I guess an analogy I could give you is that if there were an item like a pack of gum, an iPod, a car as it doesn’t really make a difference and I wasn’t able to afford it on my budget I would go without it. I wouldn’t take it/ steal it because I can’t afford it and still wanted it. So likewise with music and idol releases and everything for that matter I don’t download as it’s still stealing as the artists/idols/manufacturers don’t receive any payment/compensation for their product when you download anything without paying =/. It’s not a judgment on you or anyone else but these are my feelings and beliefs which is why I always try to support my favorite artists/idols by always purchasing their releases and also I try to promote their releases here so that other potential fans may find something new or not…but just something to have an interest in and love too. Again I understand your situation with the taxes your country imposes on imports which I think is much too high =(, and honestly if I were living there I wouldn’t have very much to listen to or watch outside of Brazil as I would only own those releases in which I could afford on such high taxes which I know would be very little. That thought did cross my mind recently too as H!P began really focused and tiny at first and then grew and grew until even in some ways Tsunku’s song writing was stretched a bit too much I think and it’s something that may have affected some of his creativity leading up to the point when they decided to graduate all of the Elder’s Club. It’s like they grew too much and in time it became unprofitable =/. It’s true that AKB is growing so quickly and now even with a youth~group and a new group beginning in Osaka as well as all of their sub groups but I have hope~* and maybe it’s blind~hope ?…but it looks like AkiP has surrounded himself with the right talent and a lot of it in terms of his 80’s style of song writing and just the way they produce their pvs♥ and shows and all of the innovative ideas that they incorporate into their idol product for fans so let’s hope that they don’t grow too much for what they’re able to dedicate themselves entirely to =). Sayaka seems to be much more of a power performer versus cute and she’s really engaging and funny as I’ve watched some t.v. 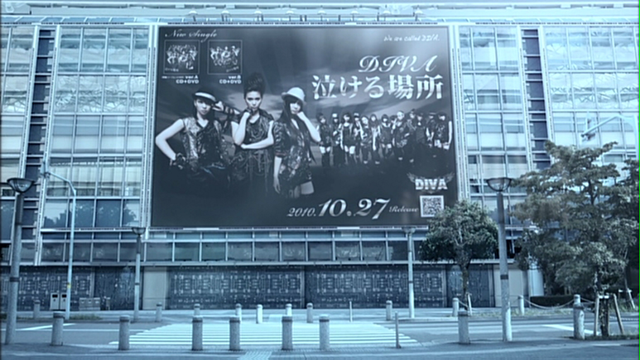 programs where she was a guest with the other girls….she really commands attention in DIVA for sure. ‘River?’….I’ll see if I get that feeling as I hadn’t noticed any similarities in melody or feel. lol ‘noise?’….you’re so funny…(^q^)! some of the akb girls has make audition to H!P too u know ?? It’s just not something I could do….but I do understand what you mean =). U~n we would have never spoken otherwise ne. Oh are you speaking of some current AKB member having auditioned for H!P awhile ago? Or something more recent? I know of the earlier auditions but nothing recent…. 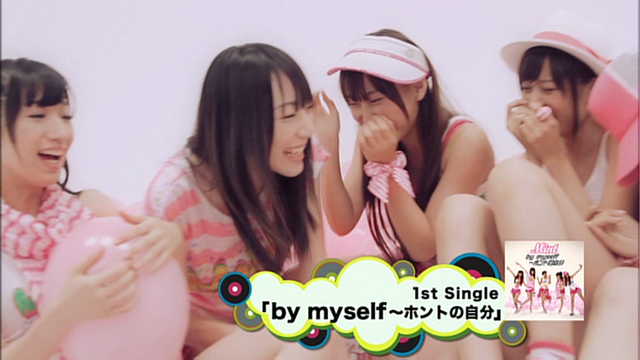 A~h well Sayaka may not be the overly~cutesy idol type for sure…I agree it’s not her natural personality. Pingback: ~An early Christmas present for Arashi♥ fans…. | モーニングBerryz48…the morning after….. "Always wear protection before reading…(^q^)." Well, if you thought the bullying in Boku Dake no Value was bad, I guess you haven’t seen the PV for Keibetsu Shiteta Aijou. In short, Acchan gets pushed around, and Yuko commits suicide. Boku Dake no Value is comparatively tamer, though the adding of a coherent storyline is always a nice touch. I really liked the PV for MINT. Reading into it, it feels like a portent of the future (of AKB), with the girls coming to terms with the reality of their (eventual) decline. 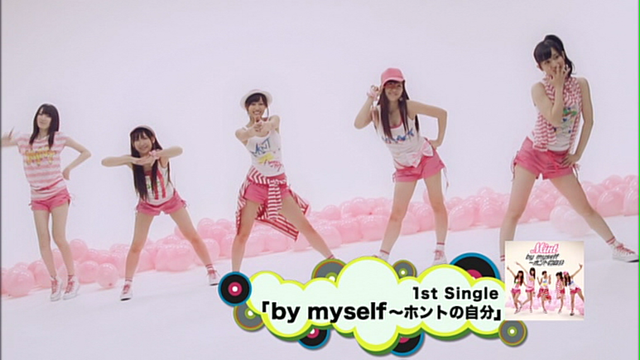 Nakeru Basho is awesome just because it has Sayaka at center. It’s about time she was recognized for her contributions to the group (along with other long time members). Oh no it’s not that….I was just writing about the pv♥ included here but I didn’t elaborate into comparing or mentioning other bullying examples brought out by the media or artists/groups/movies. It’s a sad aspect which I wish didn’t exist. It occurs in many different cultures…everywhere I imagine but it’s just that Japan has made light of it in the media. Our local t.v. station here used to show a lot of Kinpachi Sensei’s drama series and while the underlying storylines are surely meant to bring attention to this dark side of youth’s society it makes me cry seeing how this fiction is surely based on the real….Kinpachi Sensei always has so much to deal with with bullying surely being just one issue he needs to face head on and address. U~n truly as Mr. Harrison once said….”all things must pass” and even with the height of idols in the past like with Otomejuku….CoCo, Ribbon, Qlair..I imagine seeing things end were not expected by fans or those groups alike but inevitable~. So true, MINT’s pv is really symbolic this way and with AKB reaching their all~time highs right now surely I know all fans will cherish this time…..fleeting as success and popularity are =). Sayaka really can own the stage and spotlight so happy~* for her too! I was shocked by her non scandal/”scandal” and subsequent stepping down as captain…..sometimes I wish the media wouldn’t scrutinize so much =(…it’s their job but still. Idols being able to date or not…..what may be contracted?..we dont’ know but I have very strong feelings about this subject and how the wota in particular view idols to be and how them being not “involved” is pure and the “only” way to be =/. I see and understand that viewpoint but I think guys put too much into it and shouldn’t they want their favorite idols to be happy~*? I see where it comes from though…..both sides of the argument, a~h but that’s an entirely other realm of idols and I’ve already spoken tirelessly about it in the past so I’ll refrain from being overly redundant xD. Idols and dating. does yuki kashiwagi has her version of beginner?? i’ve been looking for ages but couldn’t find one, tsk..